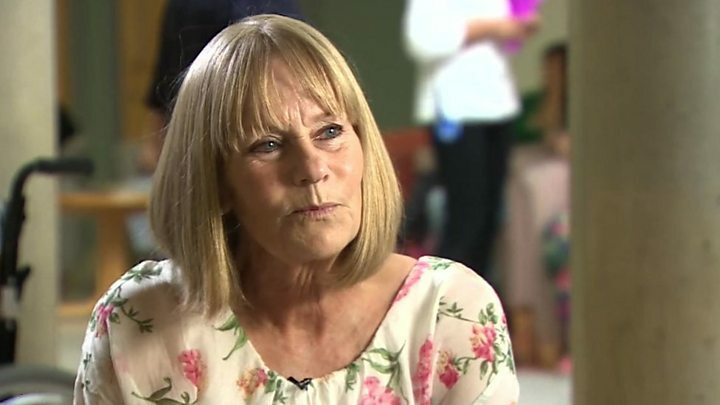 Media captionMarianne Heath: "My tumour shrank away"
A new targeted treatment for ovarian cancer has shown "very promising" results in women in the advanced stages of the disease. It shrank tumours in about half of women who took part in a small trial. Researchers had only been testing the drug to see if it was safe for humans to take, but found it had an almost instant clinical effect. It is hoped the drug could help women who have stopped responding to all other currently available treatments. So far, it has only been tested in 15 women, and the researchers say it may not be safe to take for more than a few months. However, ovarian cancer is a difficult disease to treat, and the prognosis in the advanced stages is very poor. Marianne Heath, 68, one of the patients who received the drug, said: "I had no other treatment choices, so I felt this was my only option. "I just want to keep going so I can keep the tumours at a level where I can enjoy my life. It isn't a cure, but it is life extension for me." Marianne had treatment over six months, and the drug shrak all three tumours in her body, taking away much of the pain she was experiencing. One tumour - in her back - has started growing again since she stopped the treatment in January, and she is undergoing radiotherapy for that, but the others are stable. The researchers, from the Institute of Cancer Research and the Royal Marsden NHS Foundation Trust in London, wanted to establish whether the drug, known in the study as ONX-0801, was safe, so they tested it on a small number of patients. But they found it significantly shrank tumours in seven of the 15 patients who took the drug - all seven carrying a particular molecule that the drug was specifically designed to target. ONX-0801 is the first in a new class of drugs which work by mimicking the ability of folic acid selectively to latch on to cancer cells, while leaving healthy tissue alone, thus reducing the side-effects often seen with traditional chemotherapy, such as infections, diarrhoea, nerve damage and hair loss. Once locked on to a cancer cell, the drug disrupts its chemistry by blocking the action of a key molecule, causing widespread DNA damage and cell death. The researchers, who hope to carry out bigger clinical trials as soon as possible, have also developed a test that can detect which women are most likely to benefit from the treatment. Study leader Dr Udai Banerji said: "The results we have seen in this trial are very promising. It is rare to see such clear evidence of reproducible responses in these early stages of drug development. "The beauty of this particular drug is that it is targeted to the cancer cell. This means there are fewer side-effects, making it a kinder treatment for ovarian cancer patients. "It's early days of course, but I'm keen to see this treatment assessed in later-stage clinical trials as soon as possible." Dr Catherine Pickworth, from Cancer Research UK, said: "It's encouraging to see this new drug is showing promise as a potential new treatment for ovarian cancer. "The next steps will be for researchers to test the drug in larger clinical trials to confirm it works and is safe, and to work out which women with ovarian cancer this drug could help." Prof Michel Coleman, of the London School of Hygiene & Tropical Medicine, urged caution. He said: "Shrinkage of tumours is important, but as the authors point out, that is not the same as producing the hoped-for extension of survival for women with ovarian cancer. "The excitement of the investigators is completely understandable, but one should be cautious about interpreting this result as a breakthrough for ovarian cancer patients until data on longer-term outcomes are available." The results of the trial were presented at the American Society of Clinical Oncology annual meeting in Chicago on Saturday.